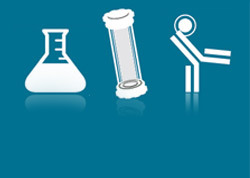 Bio-Rad offers two antibody clones specific to human IgG Fc that can be used to detect human or humanized therapeutic antibodies in non-human primate samples. 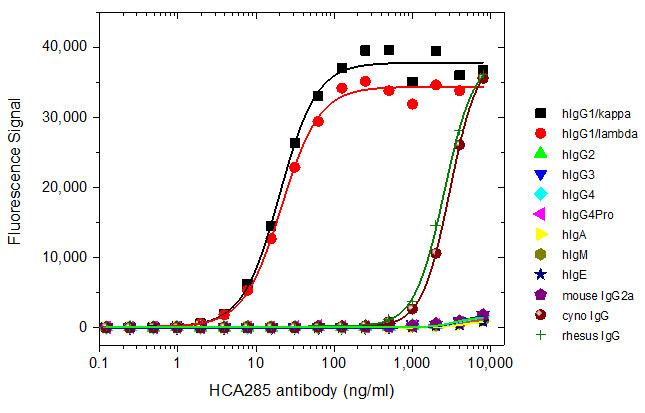 Clone AbD27686 (HCA285) is a recombinant monovalent Fab antibody, specific to human IgG1 Fc, with an affinity of 76 nM. It has been shown to have a greatly reduced affinity (about 90-fold) for IgG from cynomolgus macaque compared to human IgG1. It also has strongly reduced binding to rhesus macaque IgG. It does not recognize other human immunoglobulin (Ig) isotypes or mouse IgG2a (Figure 1). This antibody has been generated by Bio-Rad using the HuCAL® antibody library and CysDisplay® technology. It is sold for research use, with implicit permission for use for the detection of therapeutic antibodies from samples obtained from experimental animals. When tested by Bio-Rad in an antigen capture pharmacokinetic (PK) assay format, this antibody performs similarly to Mouse Anti-Human IgG (CH2 Domain) Antibody, clone R10Z8E9, in 10% cynomolgus macaque serum (Figure 2). It recognizes a different epitope on human IgG1 Fc than clone R10Z8E9 (Figure 3). Clone R10Z8E9 (MCA5748G) is a mouse monoclonal antibody specific to human IgG CH2 domain. It has been demonstrated by ELISA not to recognize IgG from the non-human primate species baboon, marmoset, rhesus and cynomolgus macaques; nor does it recognize mouse or rat immunoglobulin. Important note: Clone R10Z8E9 may not be used for the detection of therapeutic antibodies from samples obtained from experimental animals without prior consent by the owner of EP 1 853 921 (F. Hoffmann-La Roche AG, Basel, Switzerland) and /or US 7,955,806 (Hoffmann-La Roche, Inc., Nutley, NJ). Fig. 1. Demonstration of specificity to human IgG1 and strongly reduced binding to rhesus and cynomolgus macaque IgG. A microtiter plate was coated overnight with various antibodies at a concentration of 5 µg/ml. After washing and blocking with PBST + 5% BSA, increasing concentrations of the Human Anti-Human IgG1 Fc Antibody (clone AbD27686, HCA285) was added. Detection was performed using a Mouse Anti-Penta Histidine Tag:HRP (MCA5995P) in HISPEC Assay Diluent (BUF049A) and QuantaBlu Fluorogenic Peroxidase Substrate. Fig. 2. PK ELISA antigen capture format demonstrating detection of a humanized therapeutic antibody with anti-human IgG Fc-specific antibodies in cynomolgus serum. A microtiter plate was coated overnight with VEGF at a concentration of 5 µg/ml. 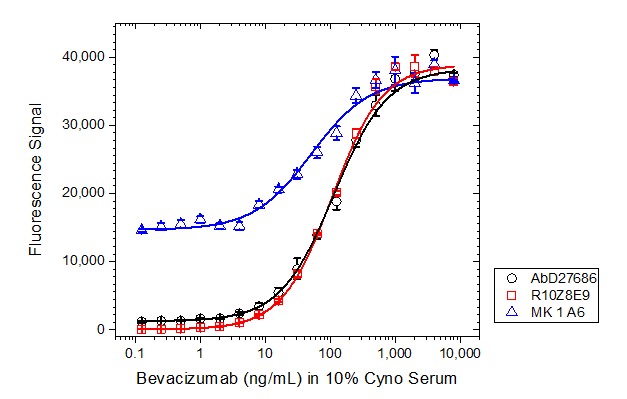 After washing and blocking with PBST + 5% BSA, 10% cynomolgus macaque serum was added spiked with increasing concentrations of bevacizumab (hIgG1 kappa). Detection was performed using either HRP conjugated Anti-Human IgG1 Fc Antibody (clone AbD27686, HCA285P), HRP conjugated Mouse Anti-Human IgG (CH2 Domain) Antibody (clone R10Z8E9, MCA5748G) or, as a control for an antibody that is not human Fc specific, HRP conjugated Mouse Anti-Human Fc CH2 Domain Antibody (clone MK 1 A6, MCA647P) at a concentration of 2 µg/ml in HISPEC Assay Diluent (BUF049A) and QuantaBlu Fluorogenic Peroxidase Substrate. Data are shown as the mean of three measurements. Fig.3. Antibody clones AbD27686 and R10Z8E9 bind to different epitopes on human IgG. A microtiter plate was coated overnight with Mouse Anti-Human IgG (CH2 Domain) Antibody clone R10Z8E9, at a concentration of 1 µg/ml. After washing and blocking with PBST + 5% BSA, a pre-incubated mixture of Recombinant Human IgG1 Kappa (HCA192) (0.5 µg/ml) plus increasing concentrations of either Human Anti-Human IgG1 Fc Antibody (clone AbD27686, HCA285) or Mouse Anti-Human IgG (CH2 Domain) Antibody (clone R10Z8E9, MCA5748G) was added. 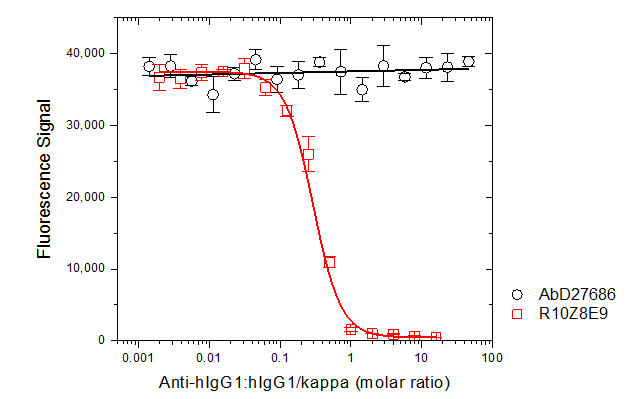 Free human IgG1 kappa antibody, still capable of binding to the R10Z8E9 coated plate, was detected using HRP conjugated R10Z8E9 antibody at a concentration of 2 µg/ml in HISPEC Assay Diluent (BUF049A) and QuantaBlu Fluorogenic Peroxidase Substrate. Data are shown as the mean of three measurements. Licensed use of clone AbD27686 (HCA285 and HCA285P): for in vitro research purposes and for commercial applications for the provision of in vitro testing services to support preclinical and clinical drug development. Any re-sale in any form or any other commercial application needs a written agreement with Bio-Rad.